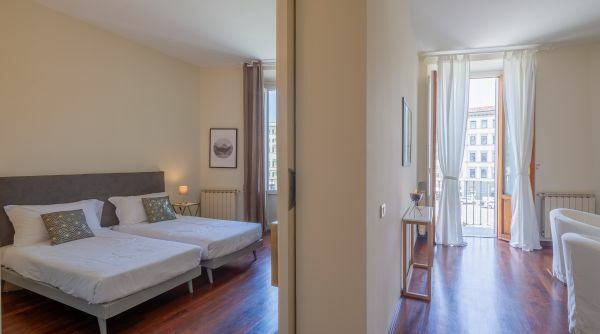 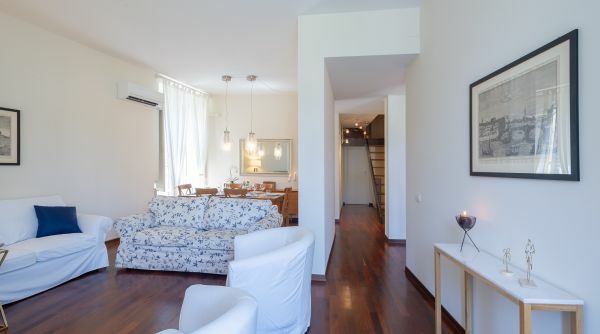 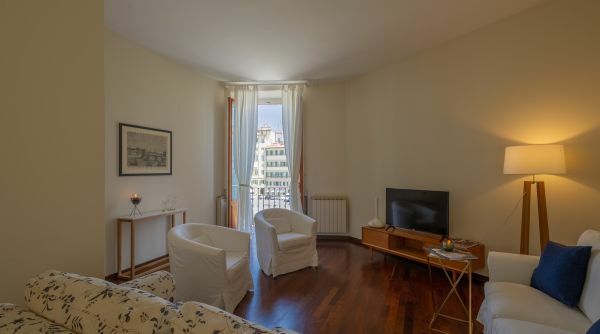 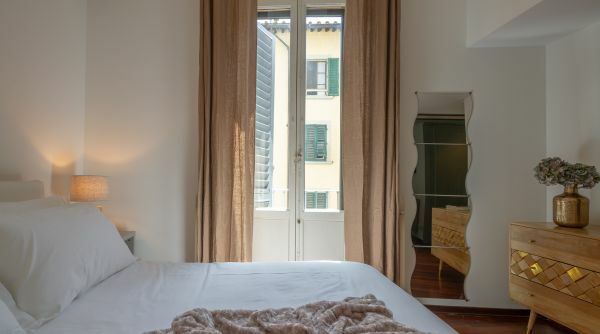 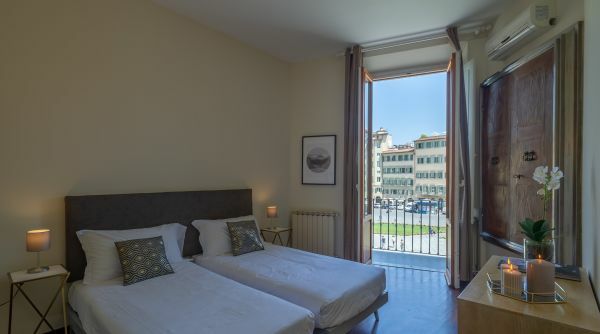 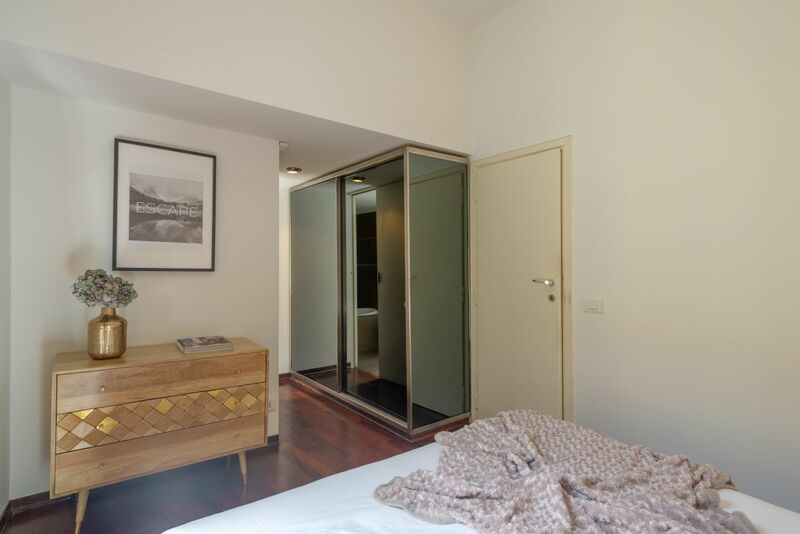 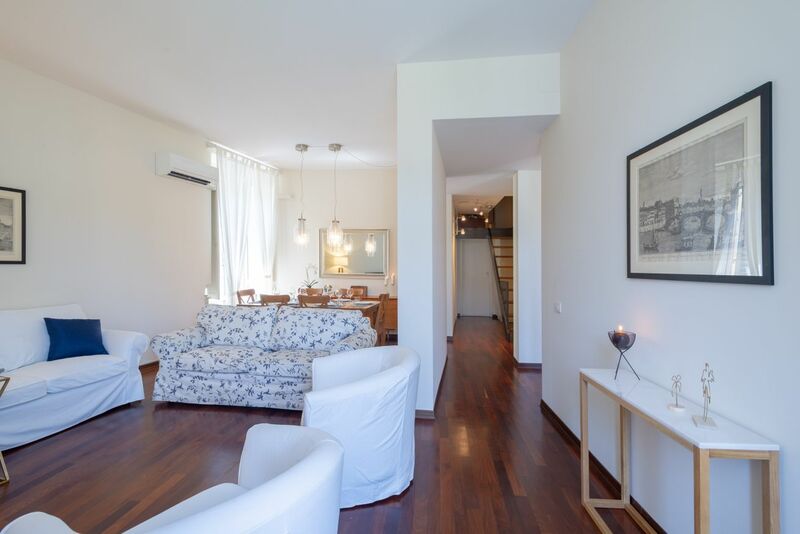 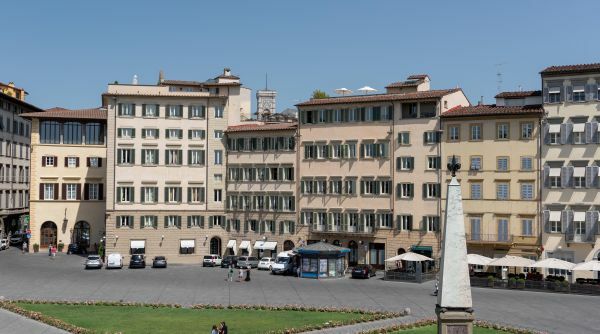 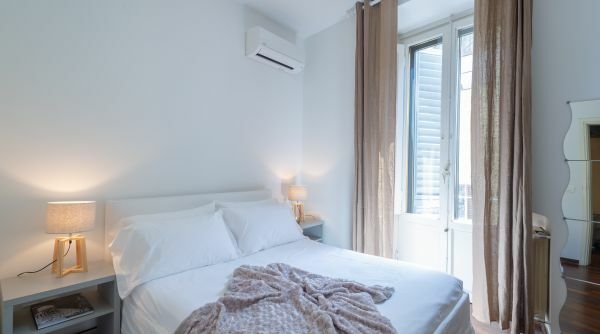 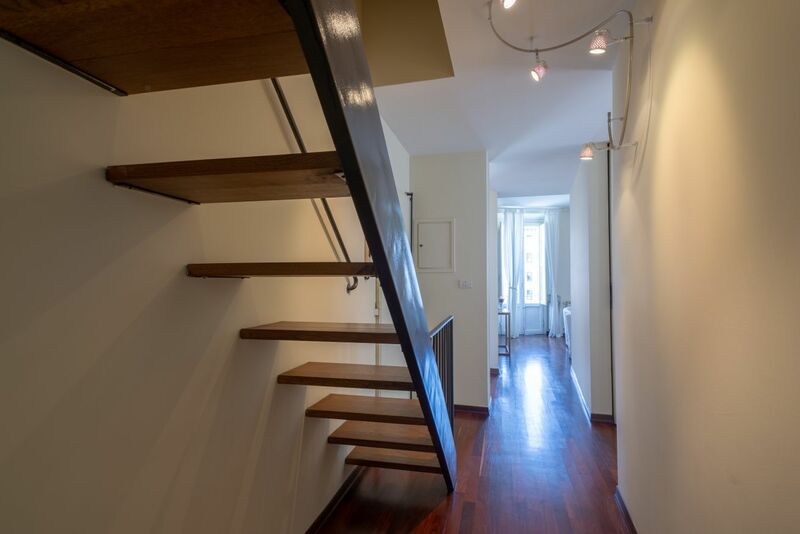 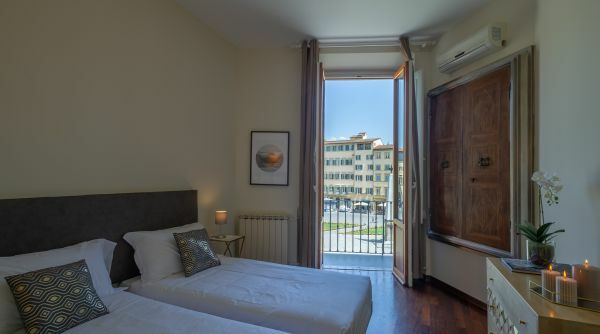 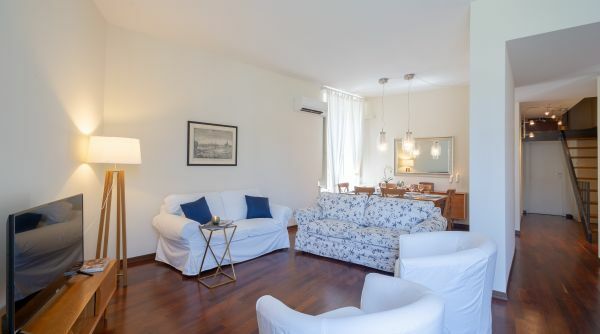 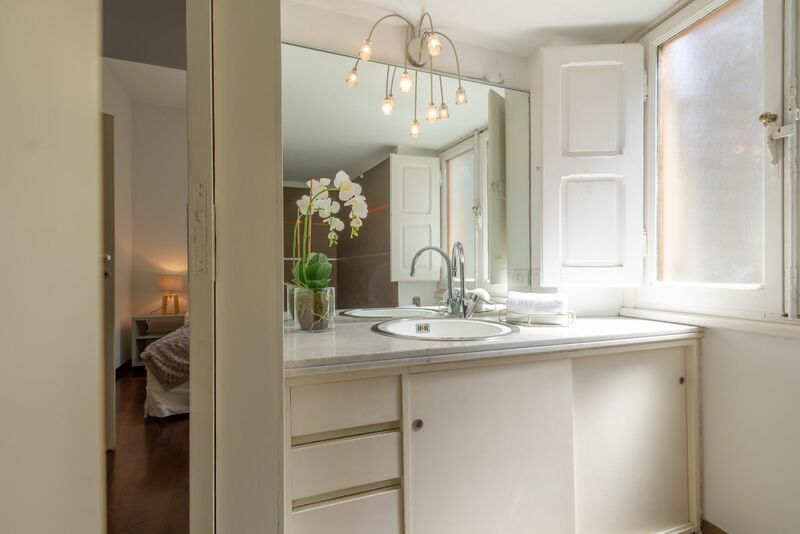 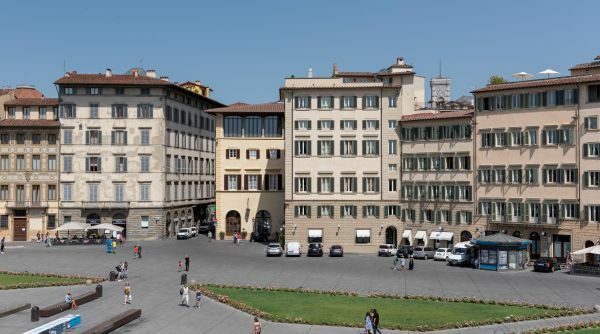 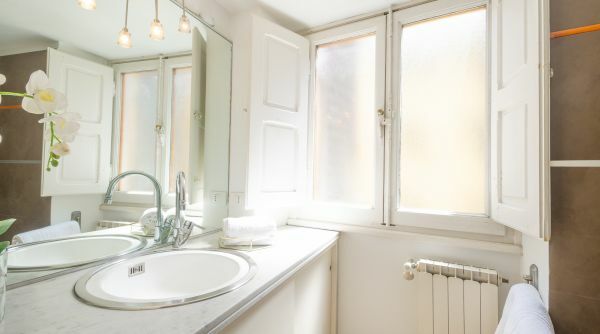 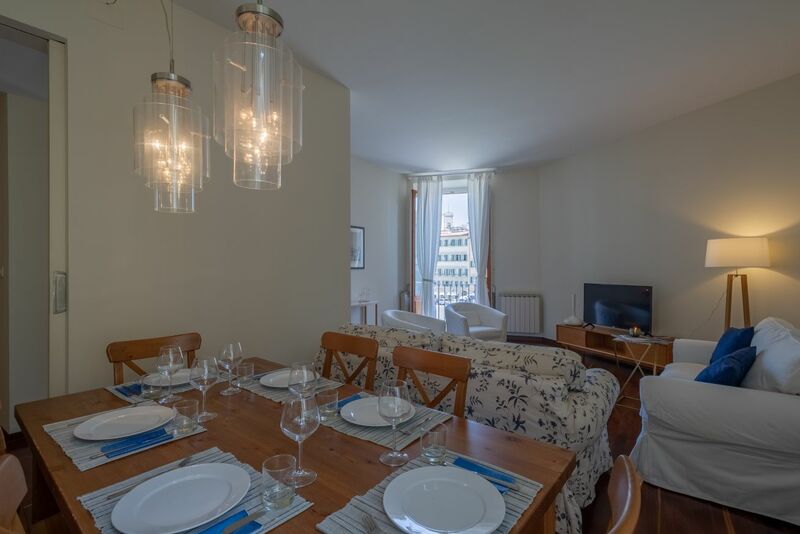 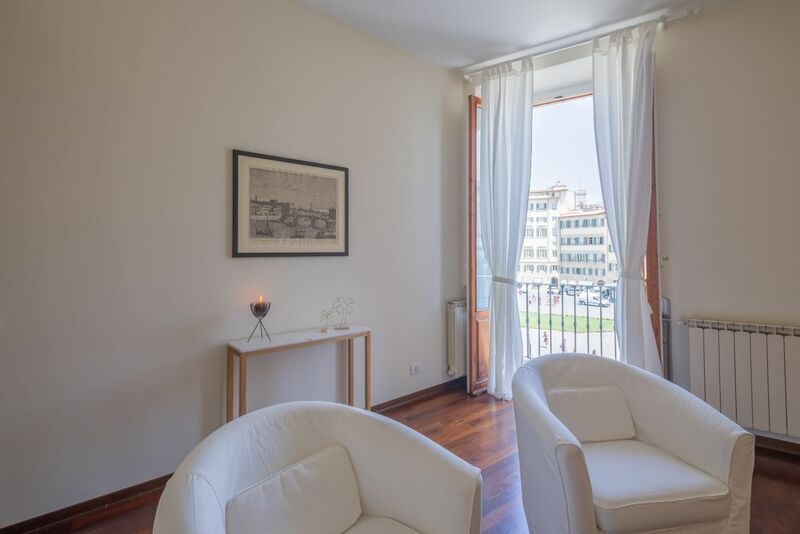 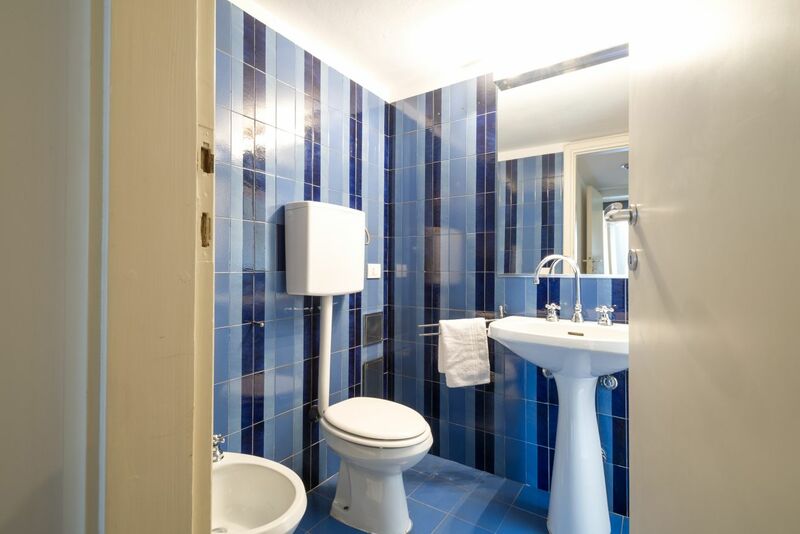 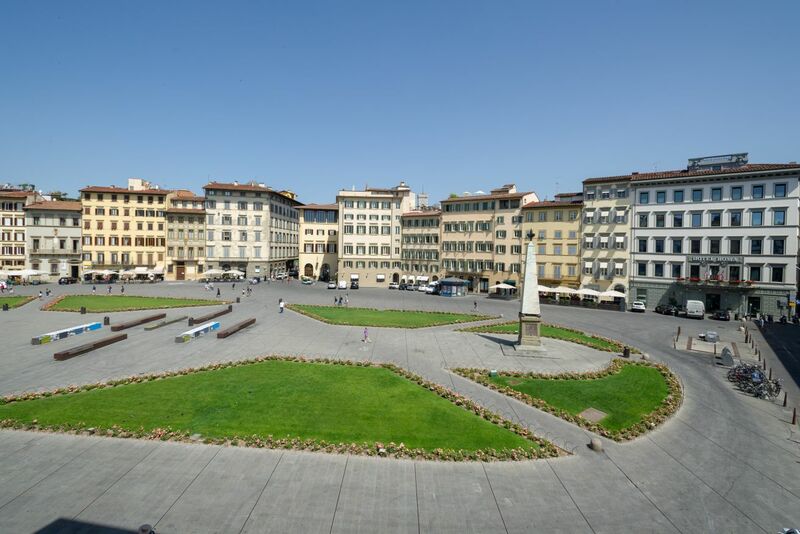 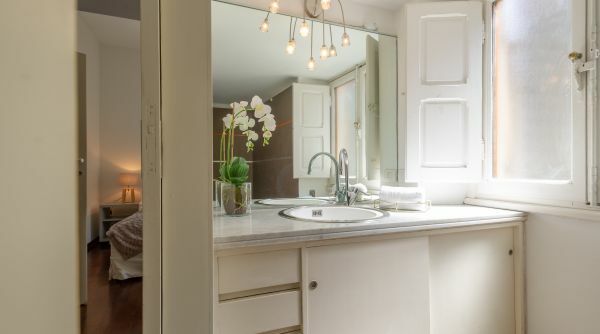 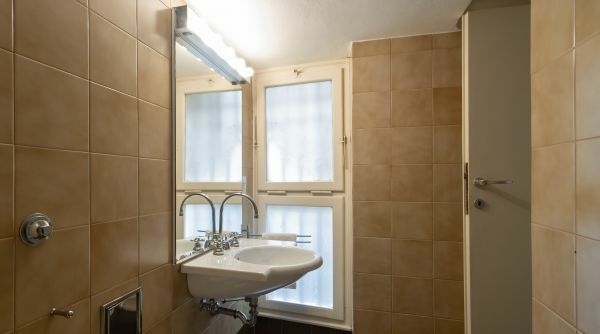 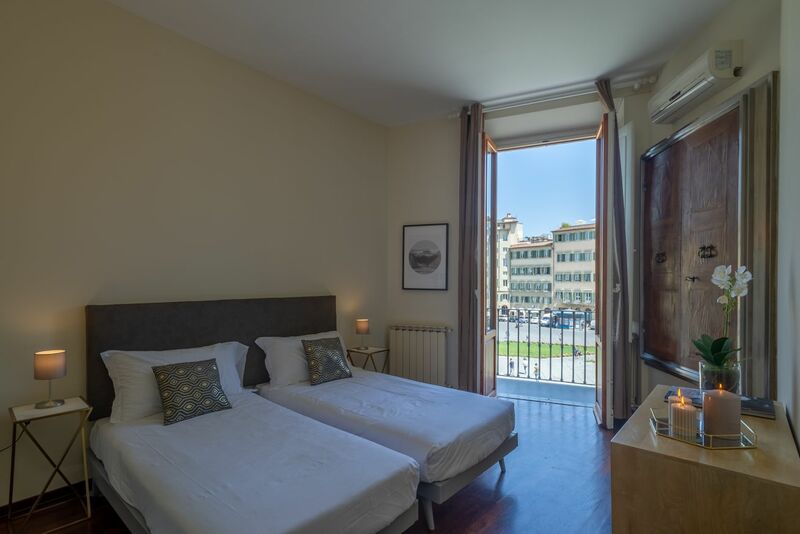 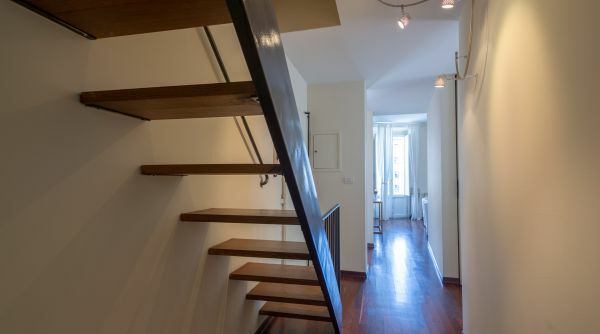 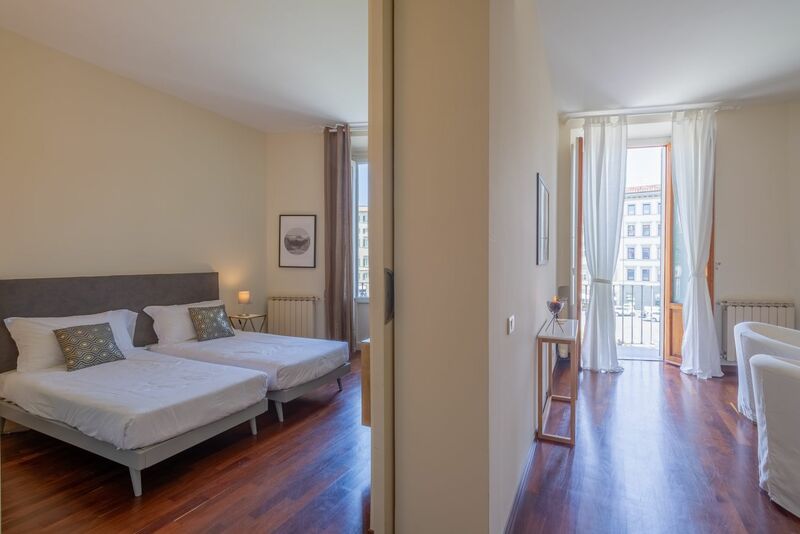 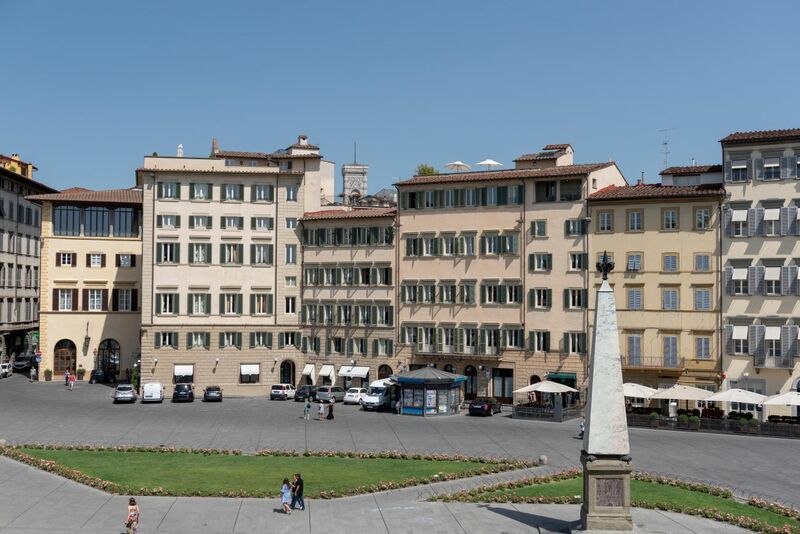 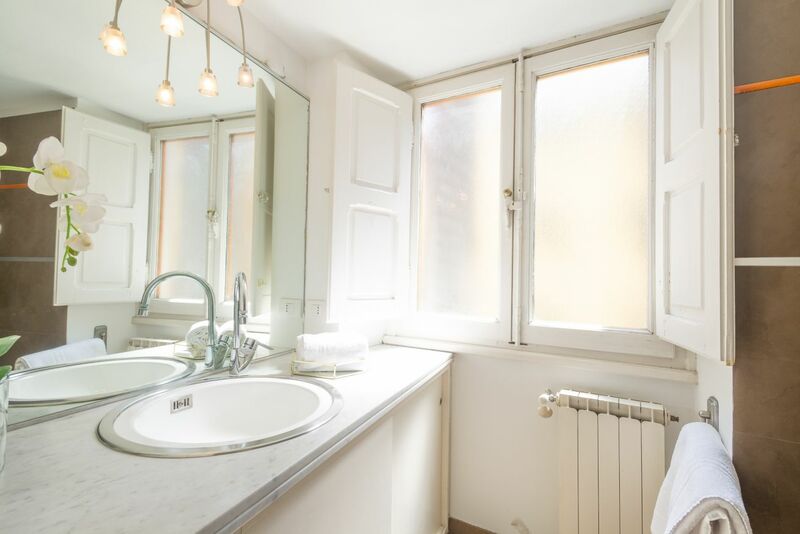 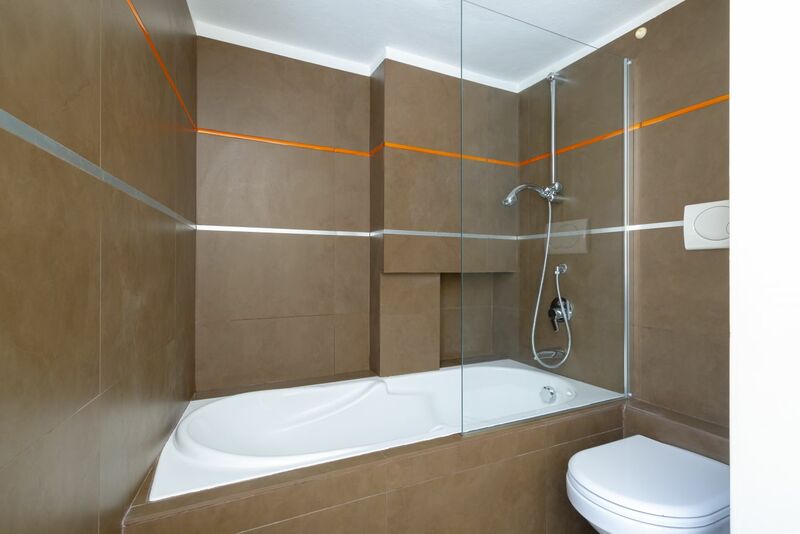 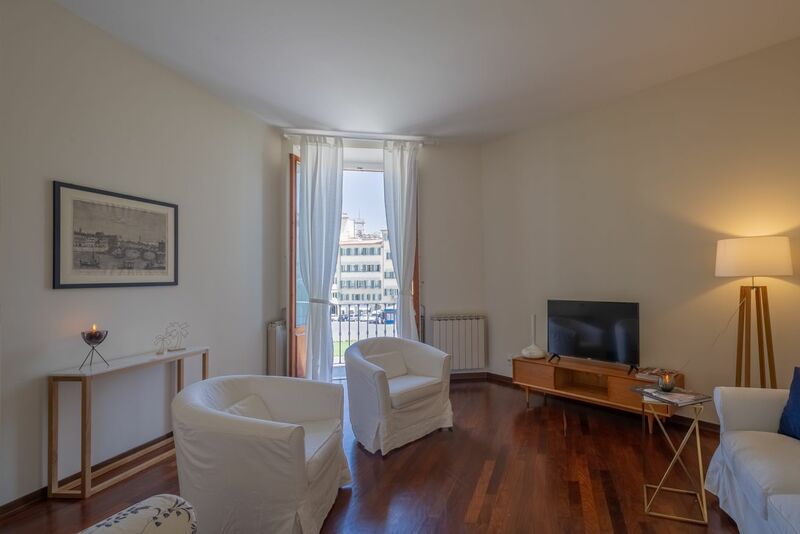 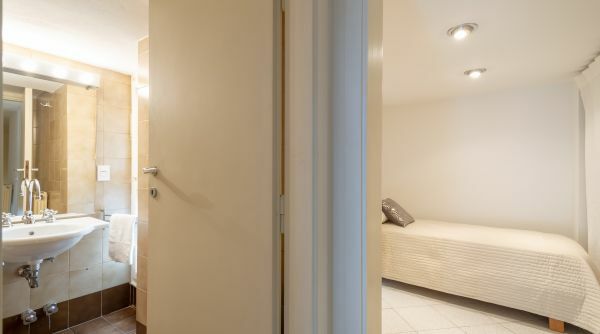 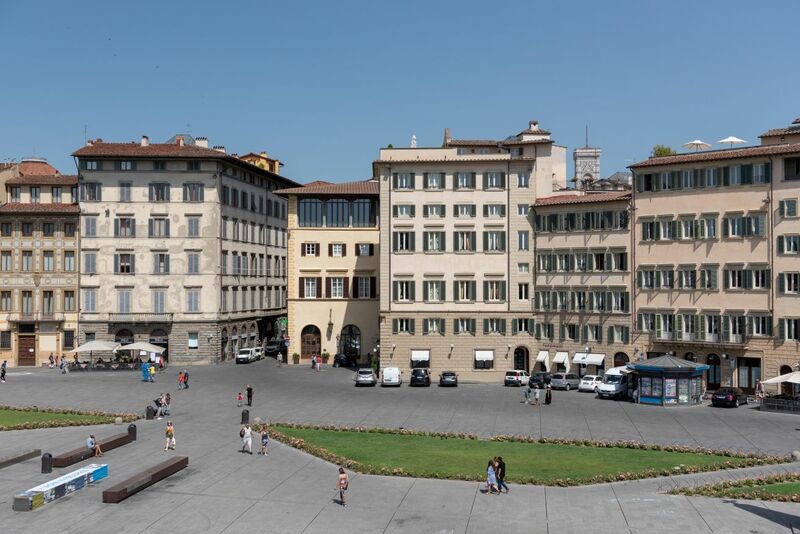 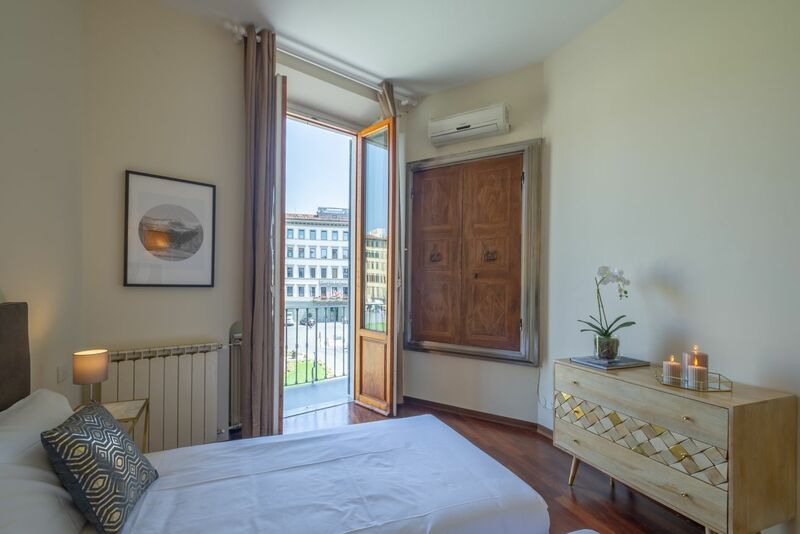 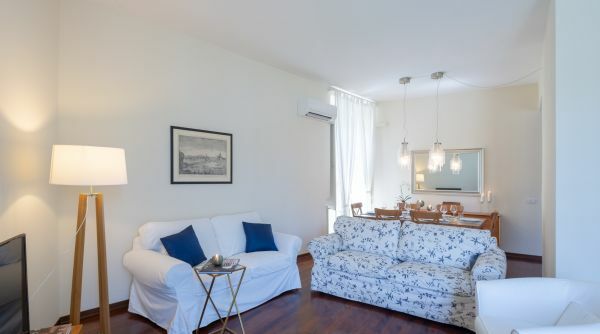 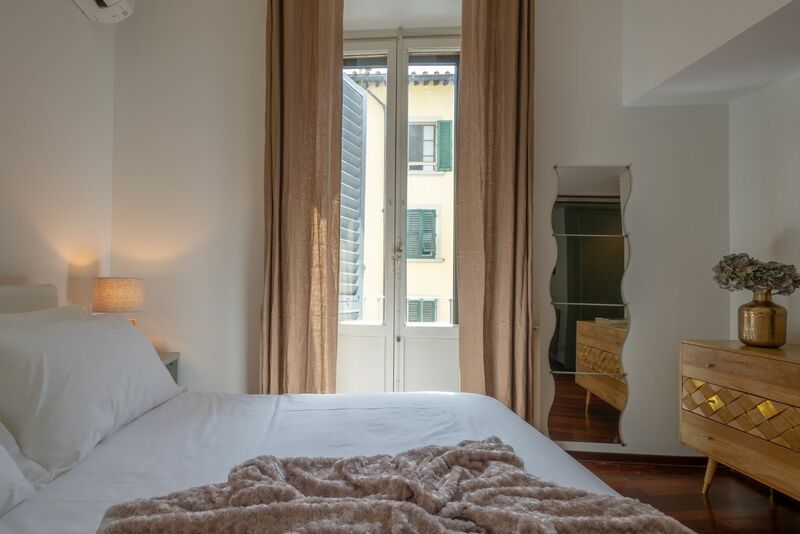 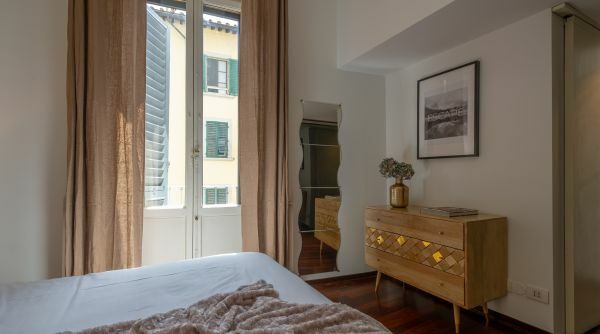 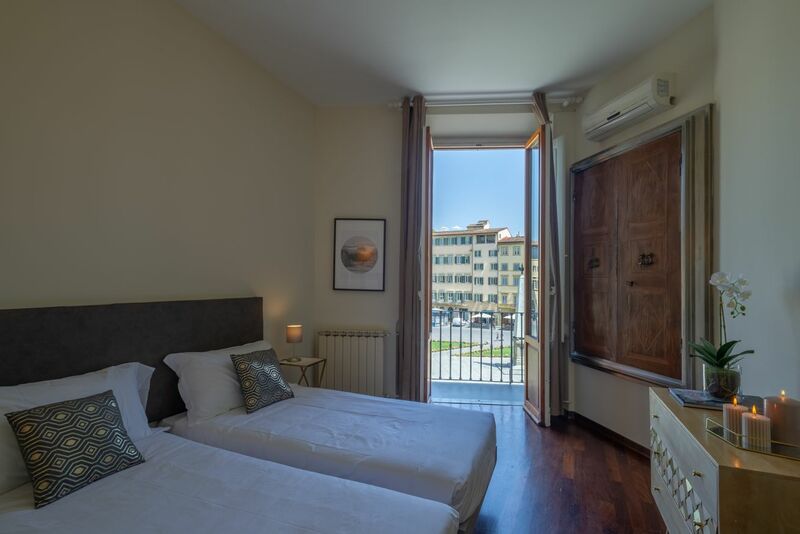 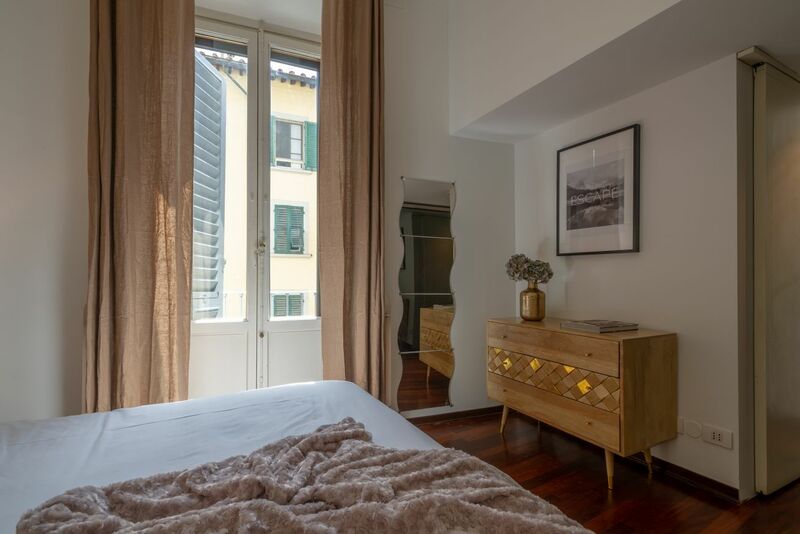 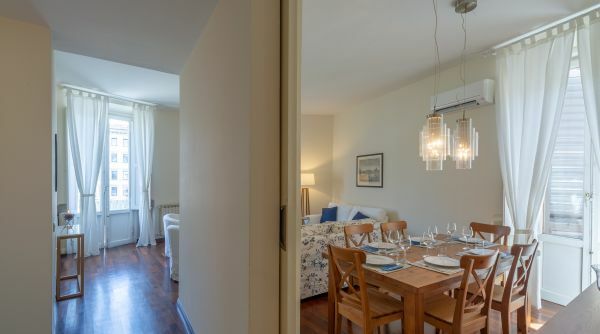 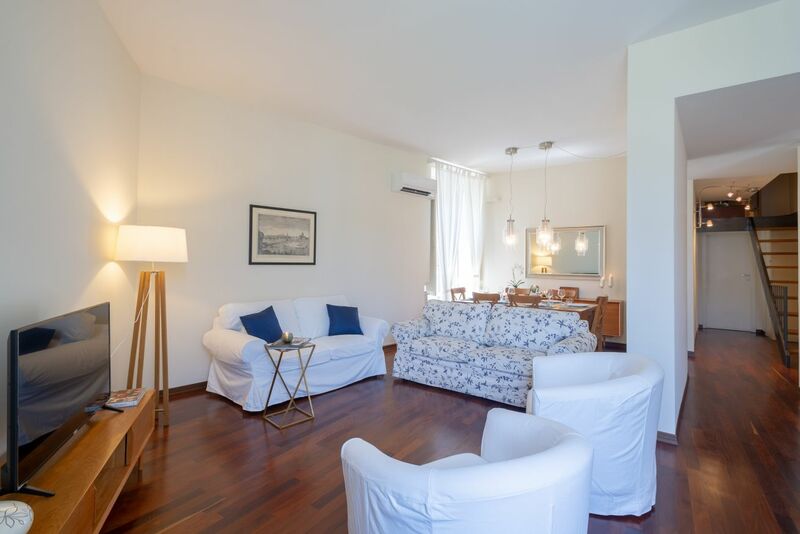 Spacious and modern, this apartment overlooking Piazza Santa Maria Novella is a real treat! 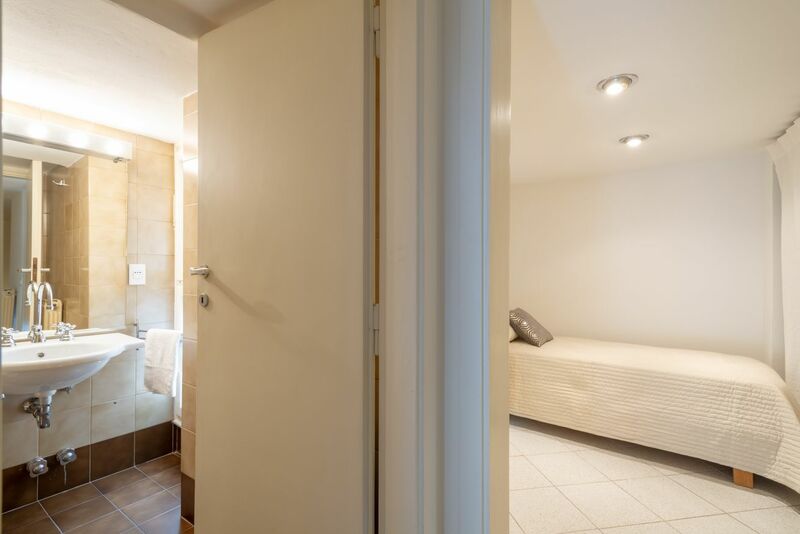 Everything is within walking distance, and the central station is two minutes away! 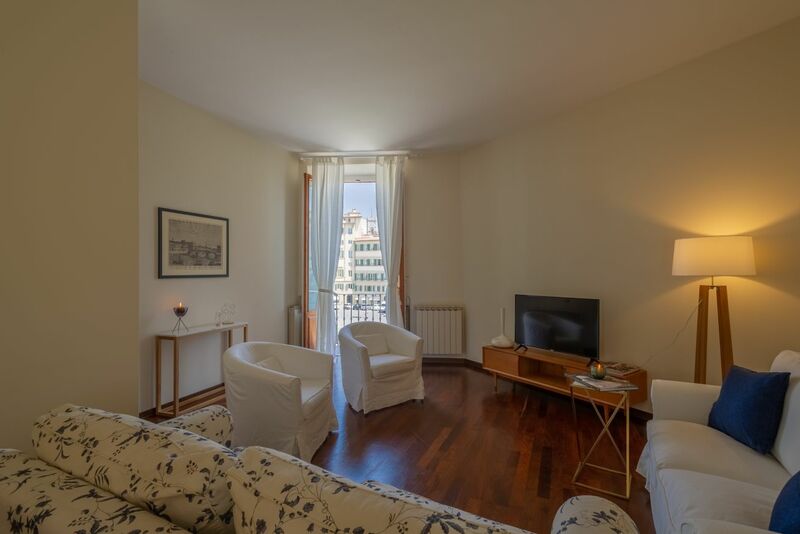 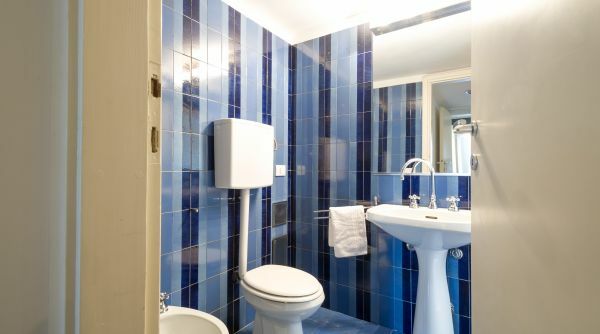 This beautiful apartment is located on the second floor of an elegant building right in Piazza Santa Maria Novella with elevator. 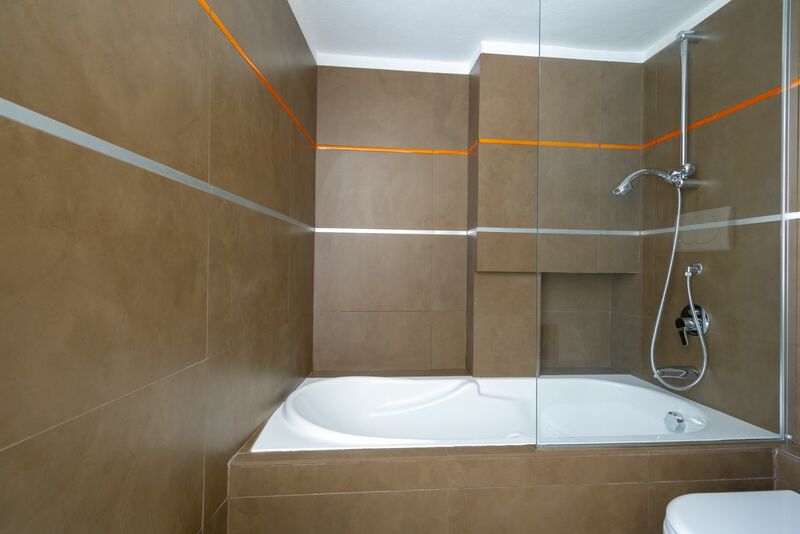 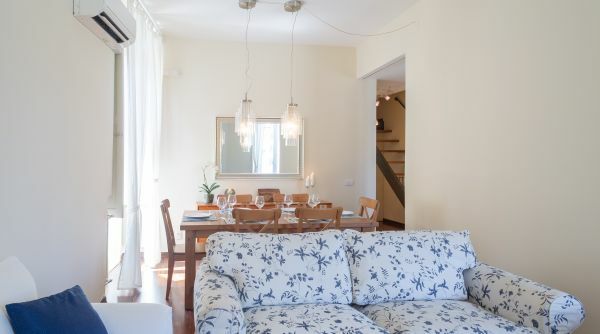 The whole place has just been renovated and redecorated with great taste and careful attention to details. 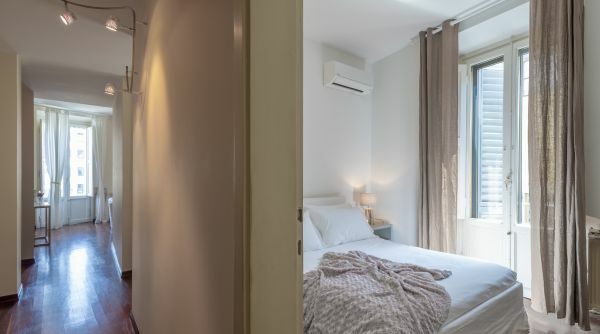 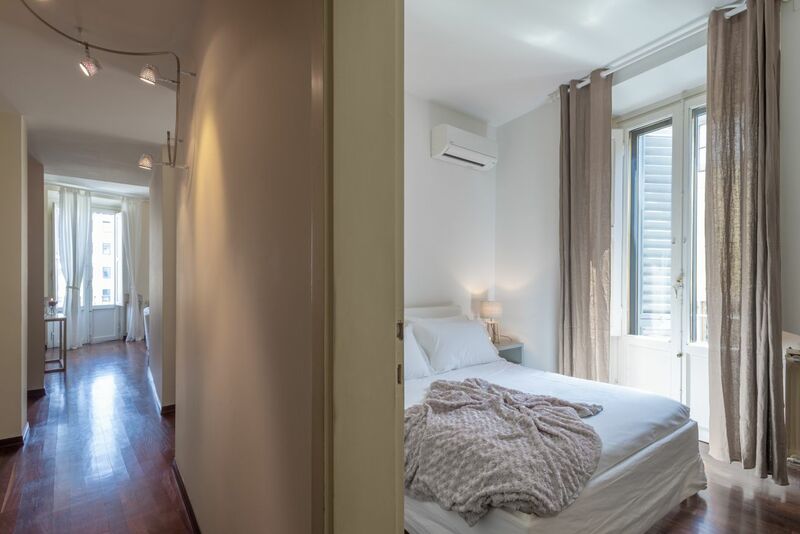 The apartment develops over two floors and can accommodate up to five guests, thanks to three bedrooms and three bathrooms. 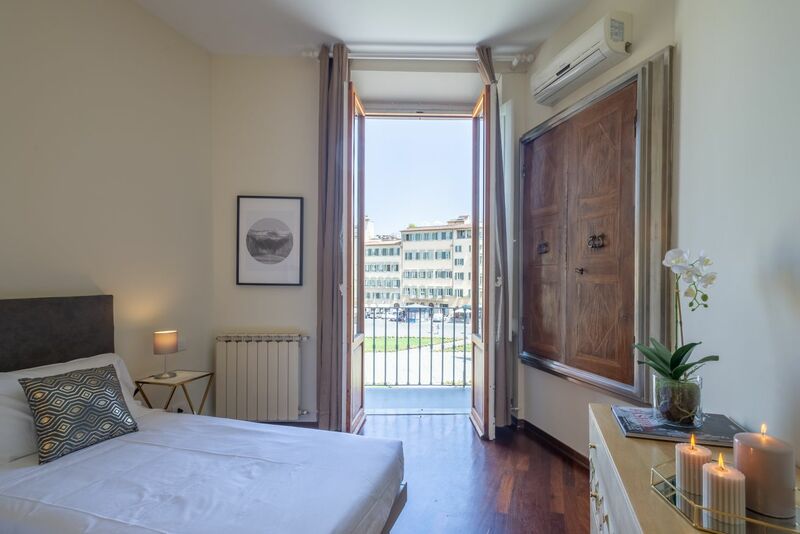 In the first floor every room has a welcoming feel, thanks to the beautiful light colored and the parquet floors, which combined with the great amount of natural light coming from the many windows, creates a very airy and soothing atmosphere. 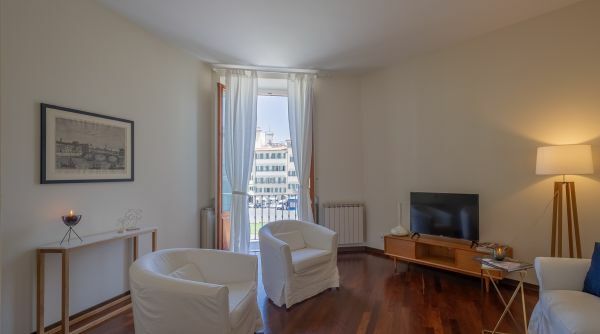 The entrance opens onto a corridor where you will access the living area that consists of two nice and comfortable sofas and two arm chairs, flat screen TV and a large dining table for six, there are also two window doors that permits the natural light to come in. 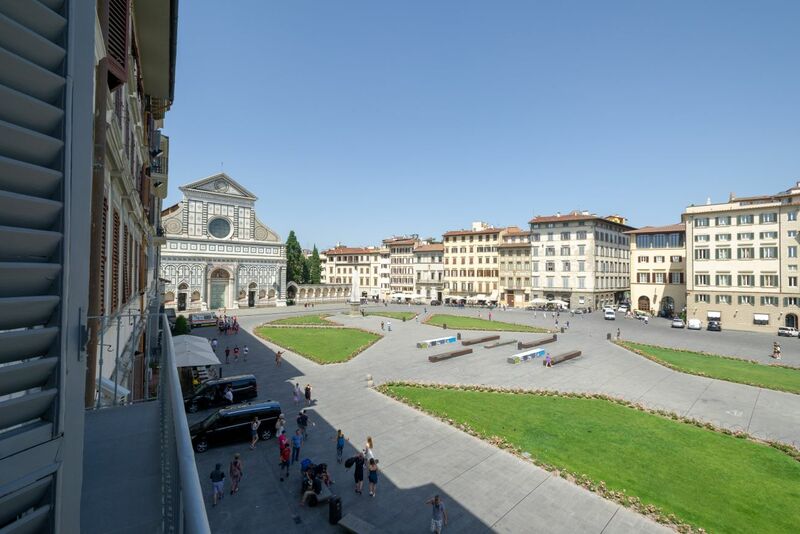 The view from the balcony is just stunning: with a glance you can see the whole Piazza Santa Maria Novella and the Santa Maria Novella Church! 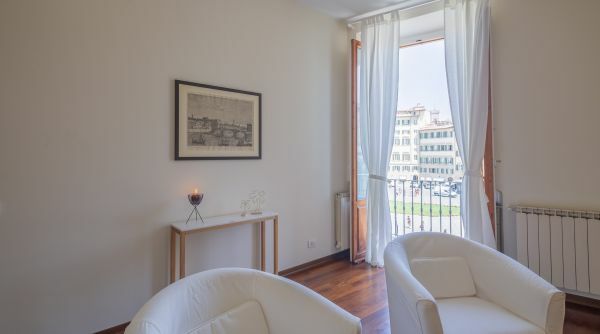 A truly Florentine atmosphere! 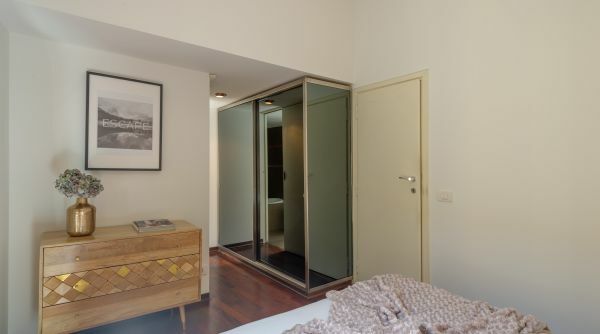 On the same floor after the living room there is the twin bedroom with two twin beds. 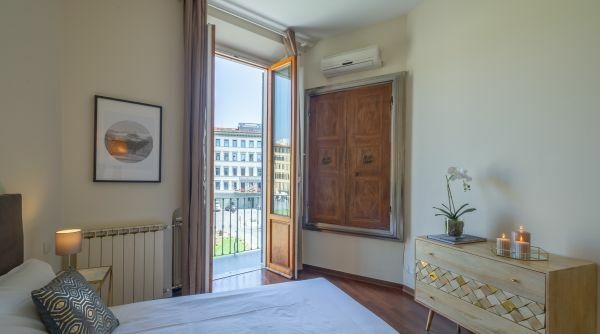 Also this bedroom has a window door that opens to the balcony and let the natural light to come in. 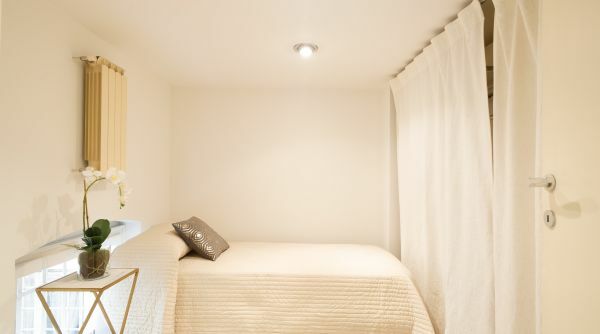 In the same bedroom there is a very beautiful build-in wardrobe . 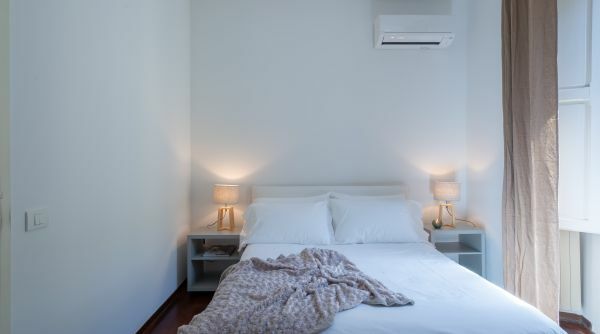 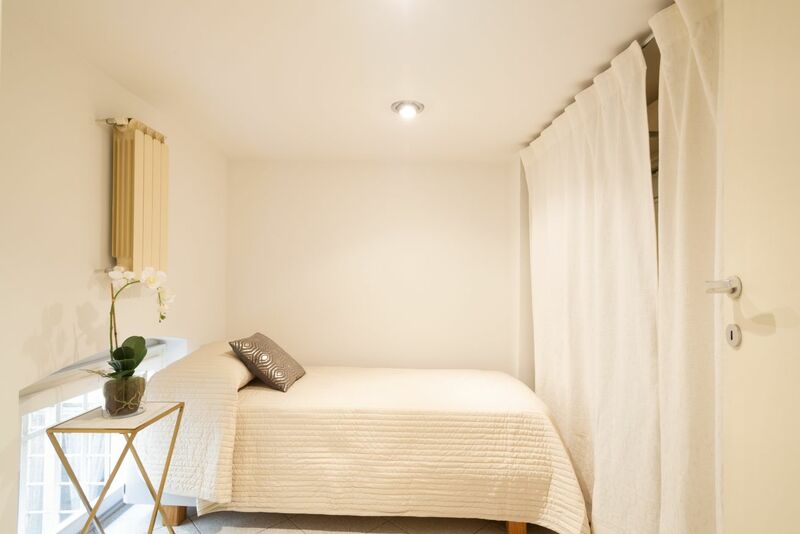 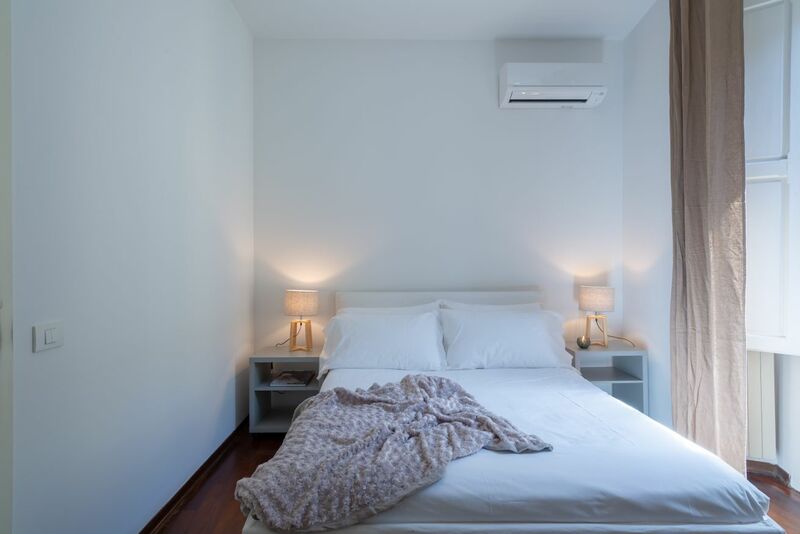 From the other part of the living room there is the master bedroom with a double bed, a spacious wardrobe, access to a balcony and an ensuite bathroom. 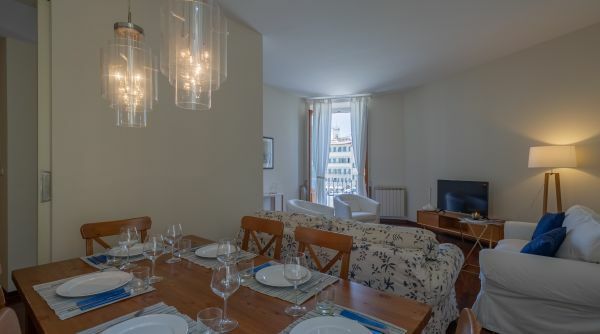 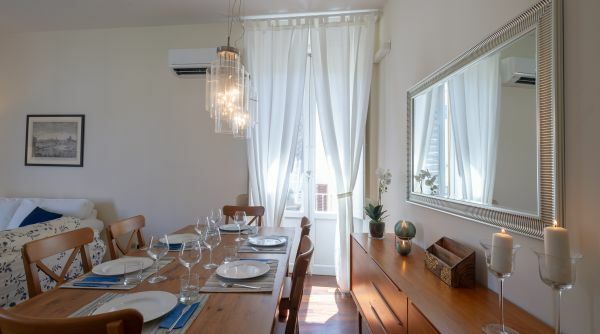 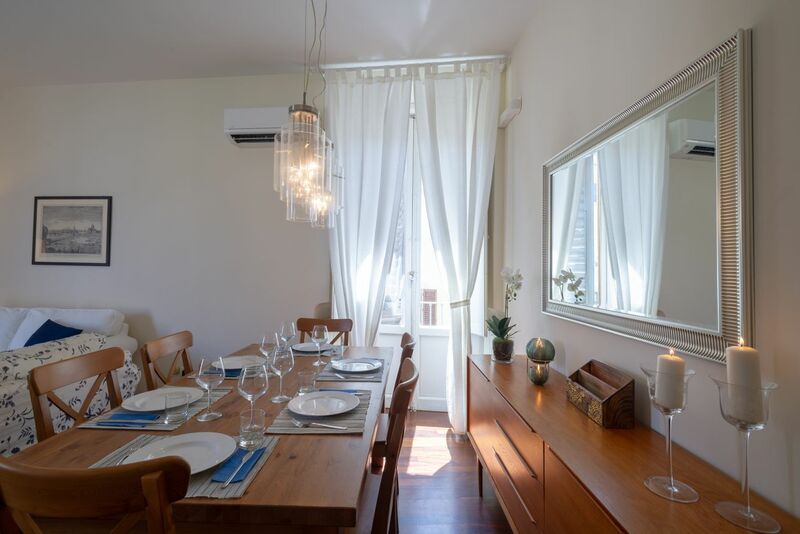 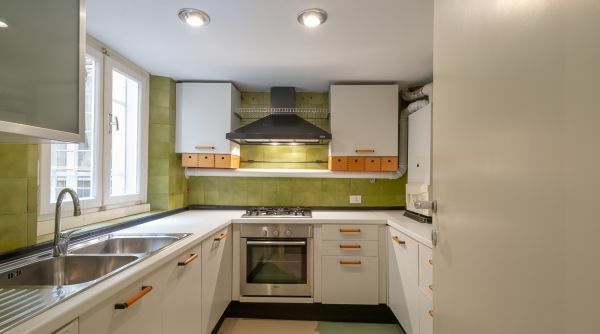 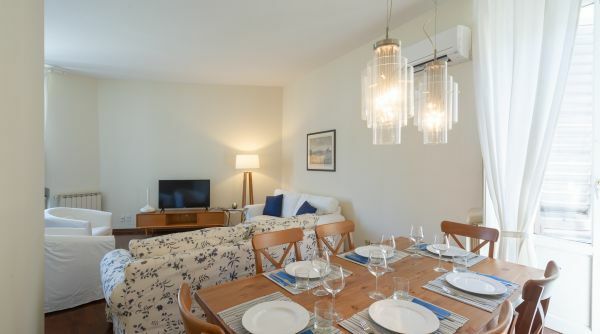 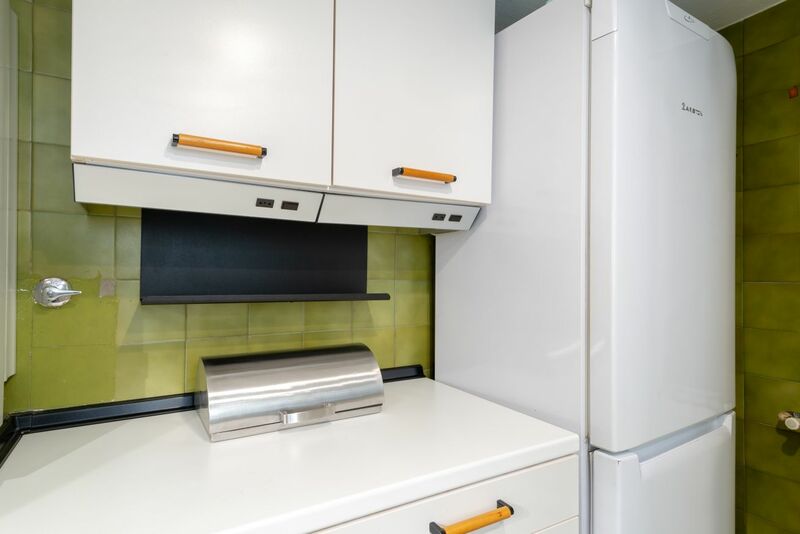 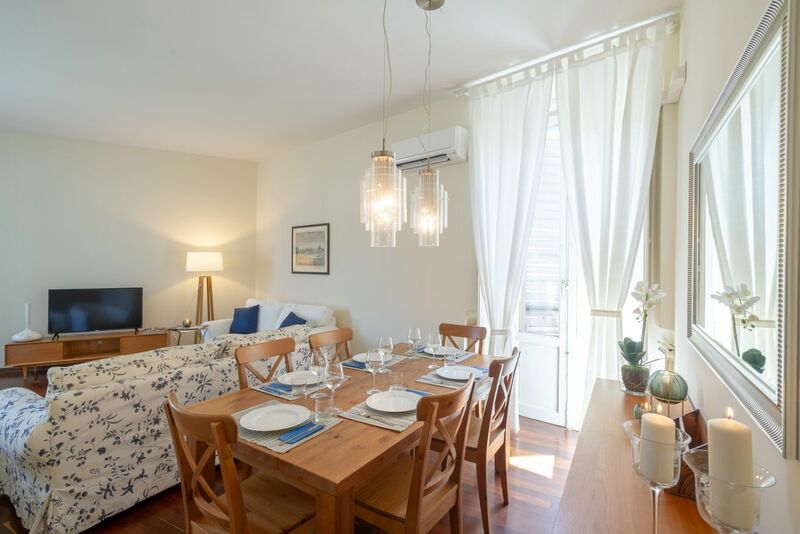 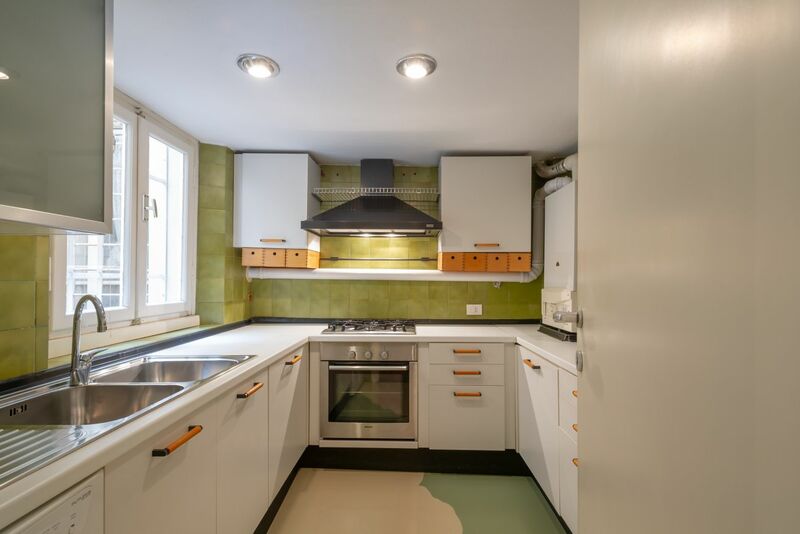 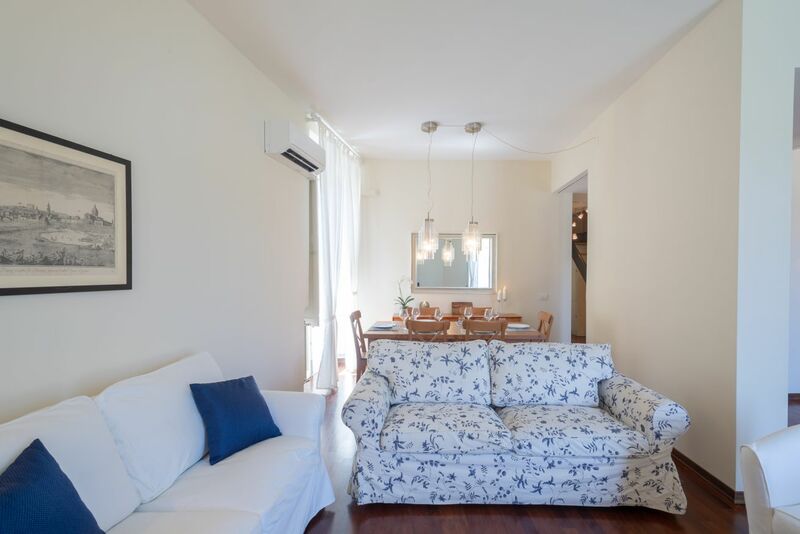 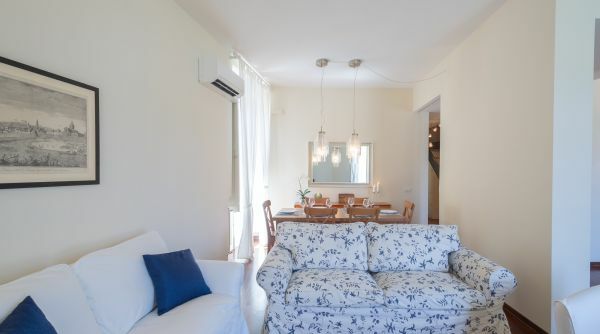 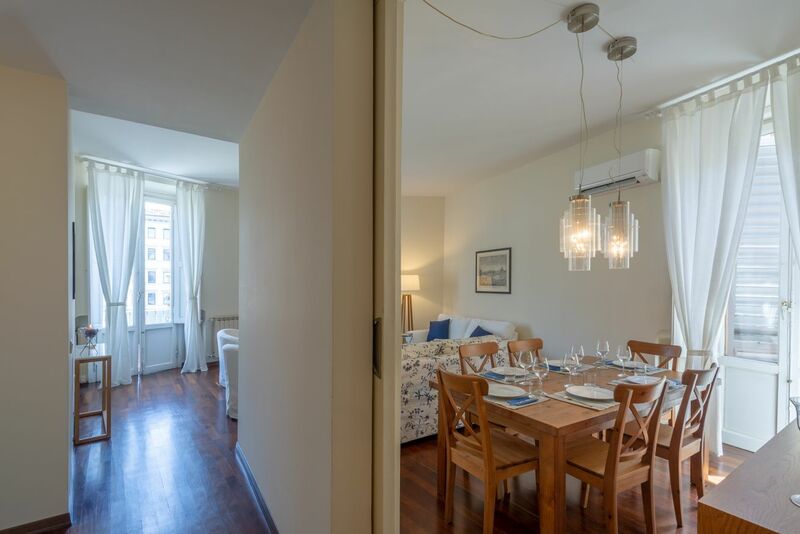 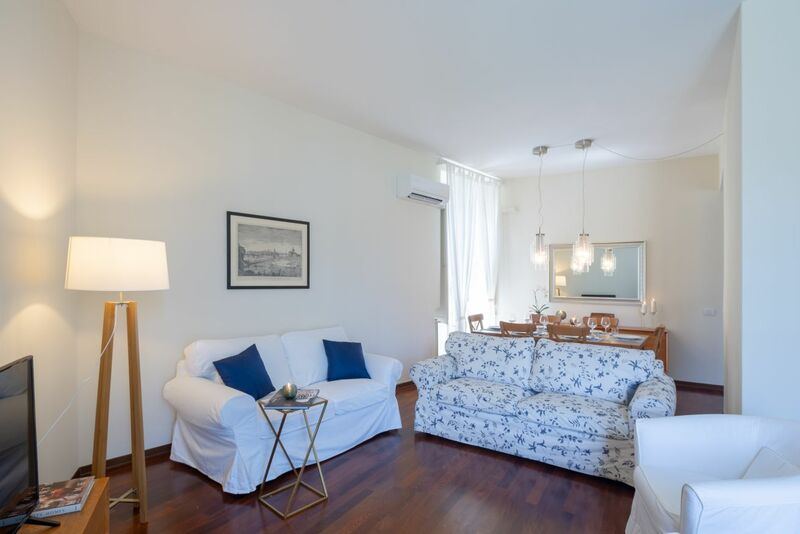 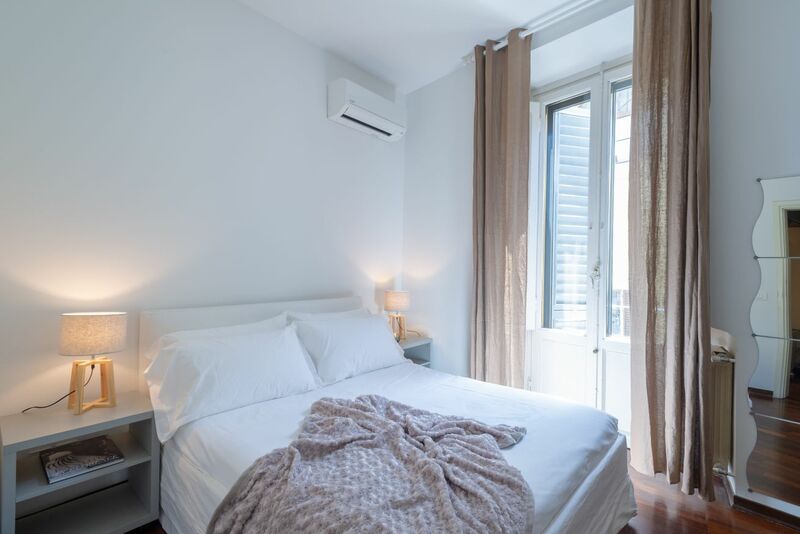 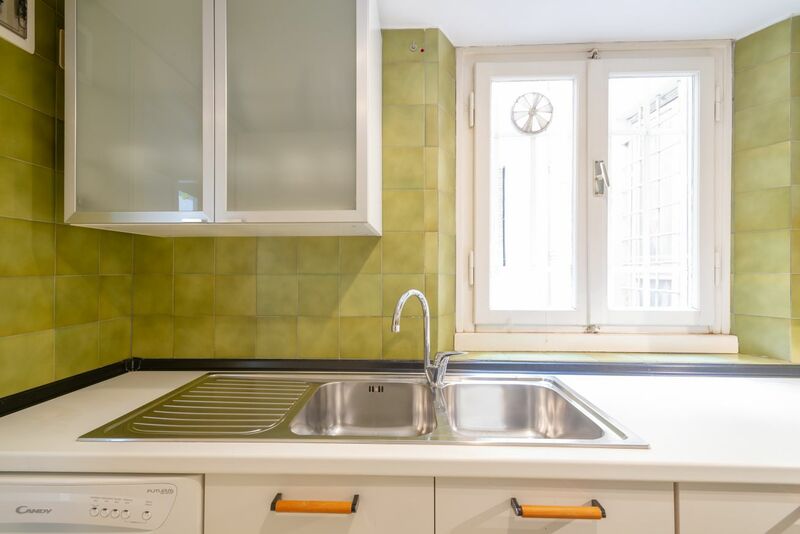 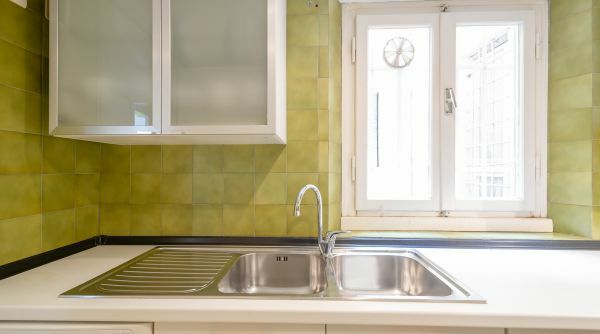 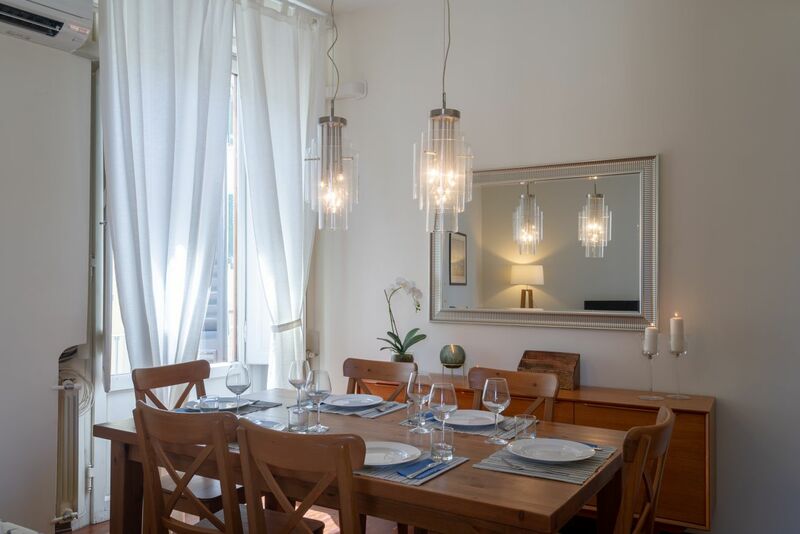 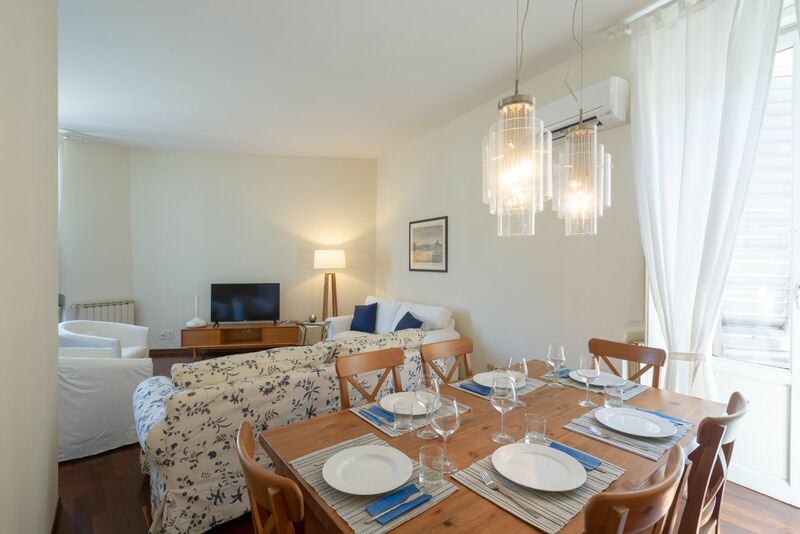 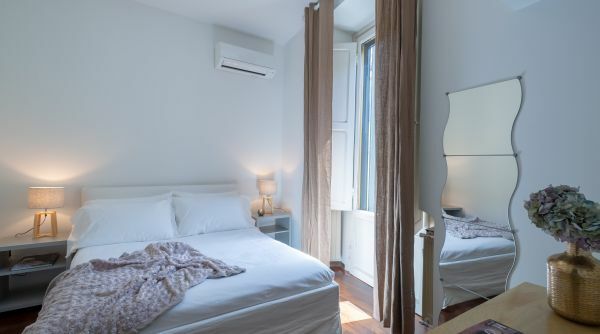 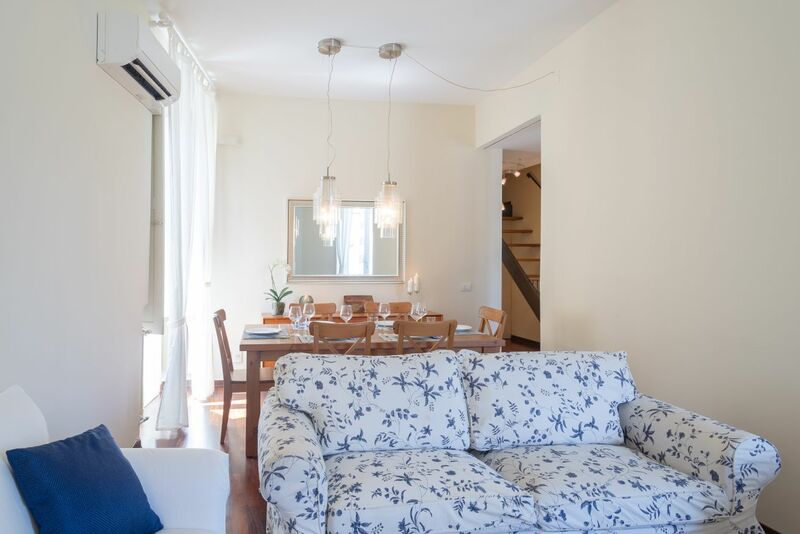 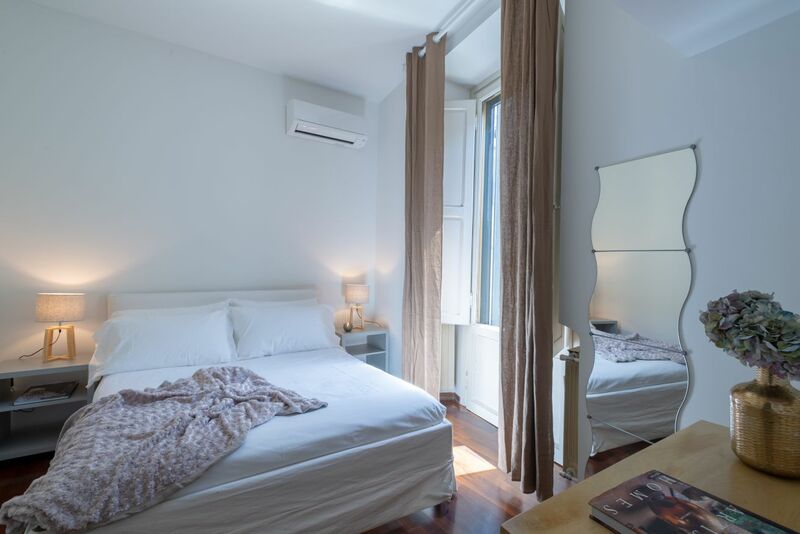 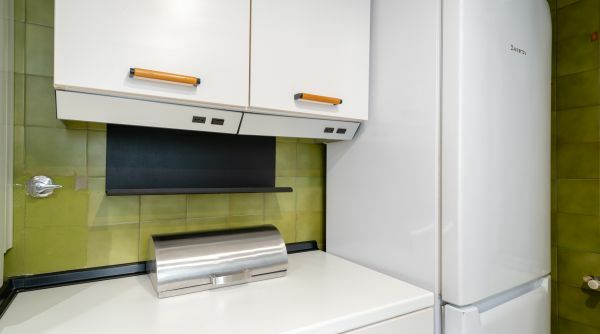 The kitchen, is located after the master bedroom and has plenty of cooking space and is fully equipped with anything you may need to cook your own favorite italian pasta while in Florence. 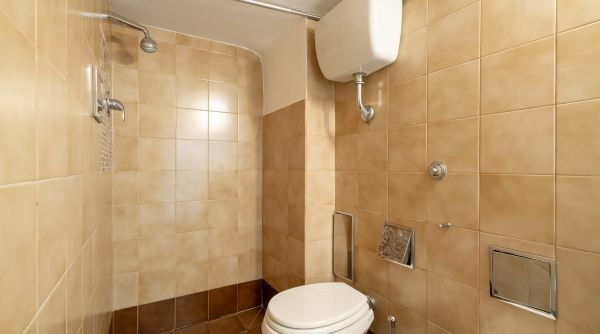 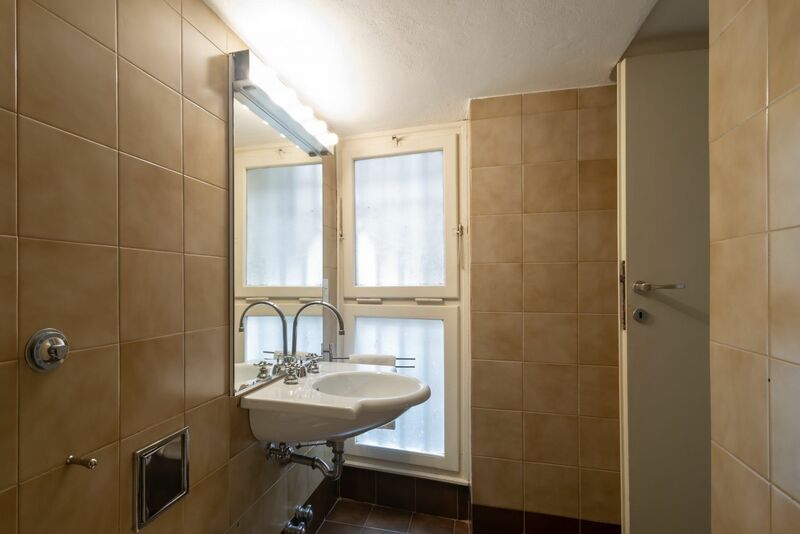 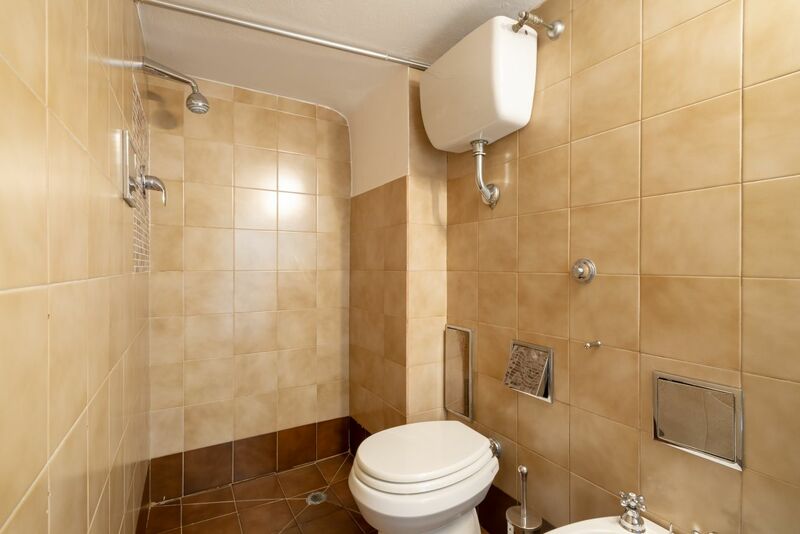 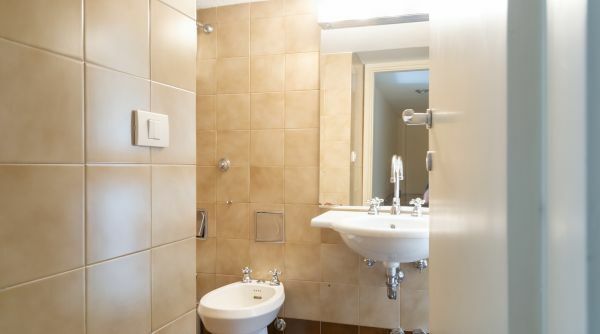 On this floor you can also find the second bathroom. 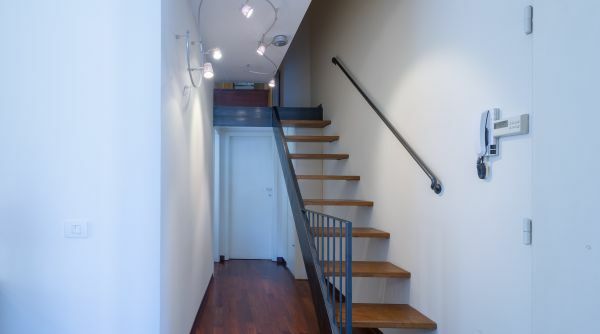 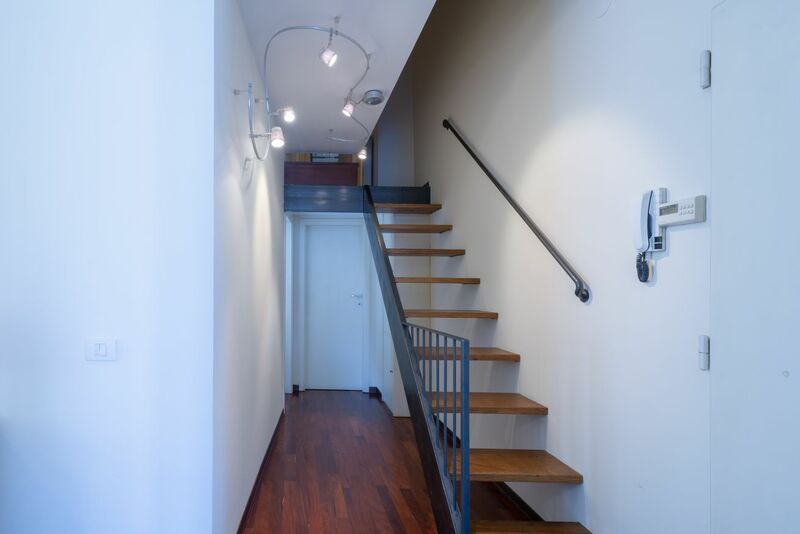 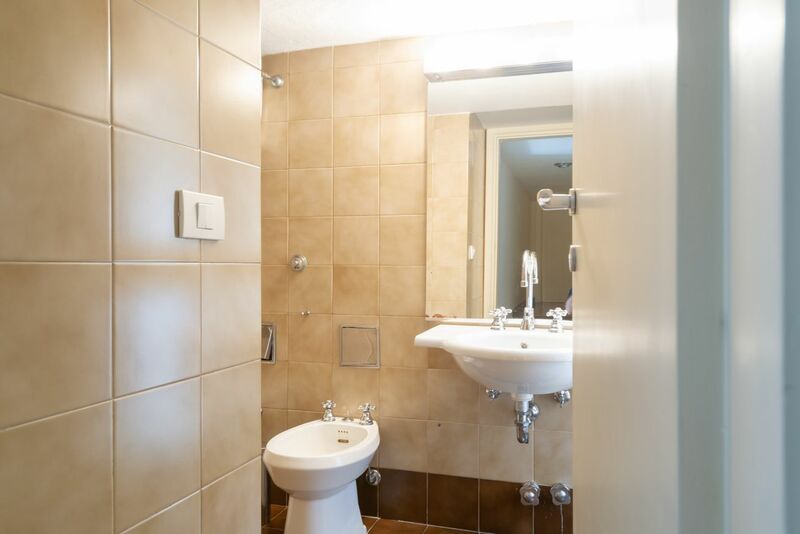 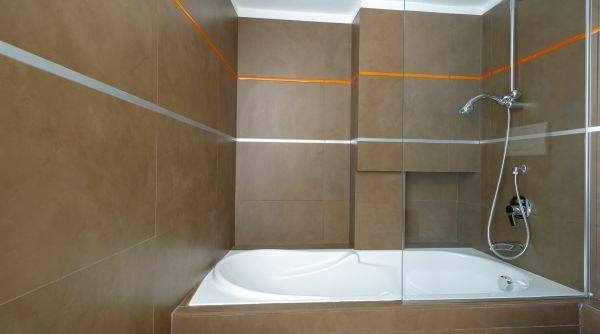 As you walk up the stairs for the second floor you will find the third single bedroom with an ensuite bathroom. 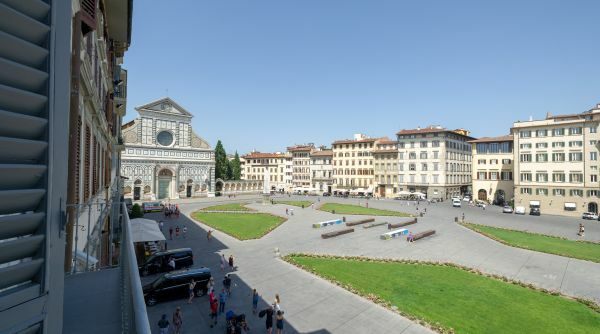 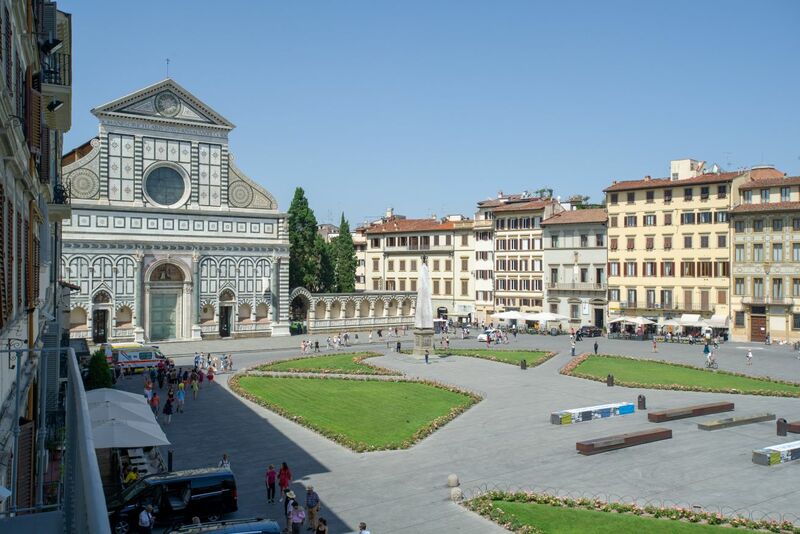 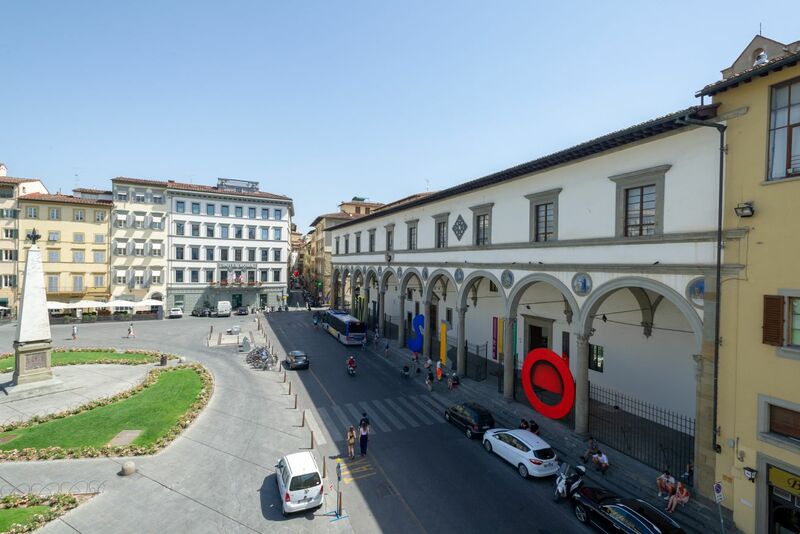 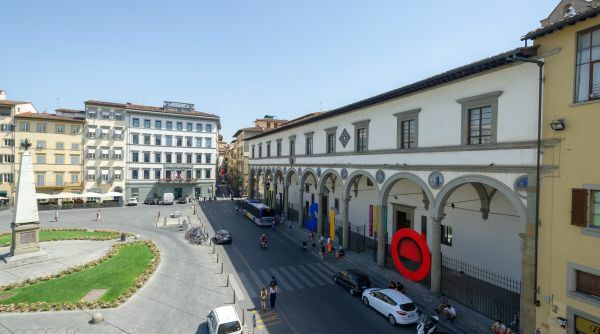 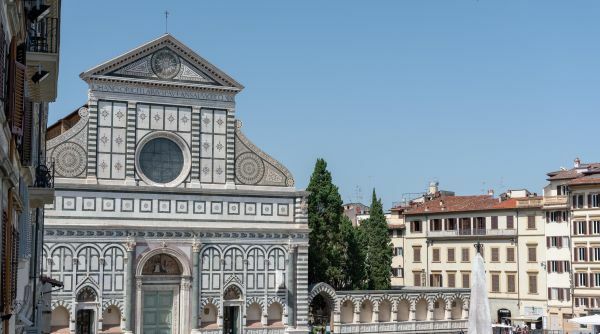 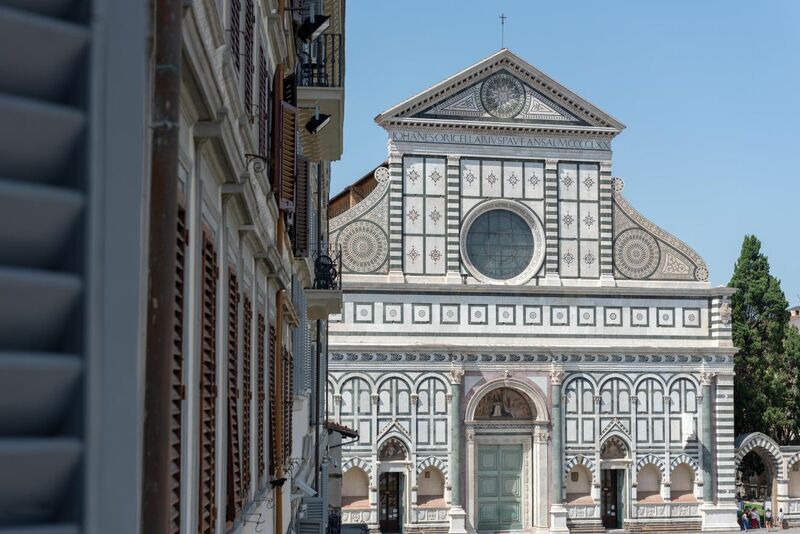 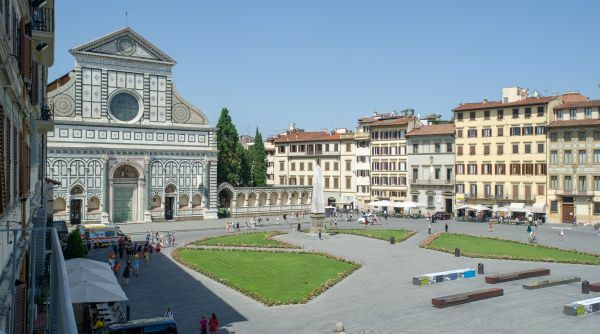 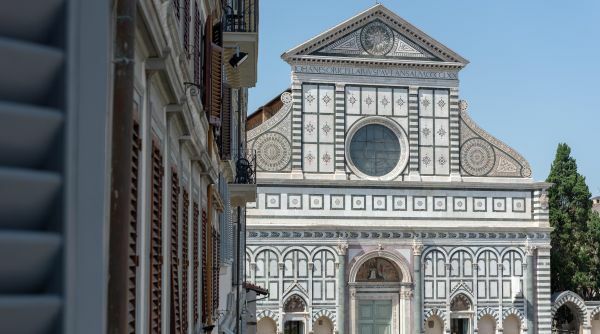 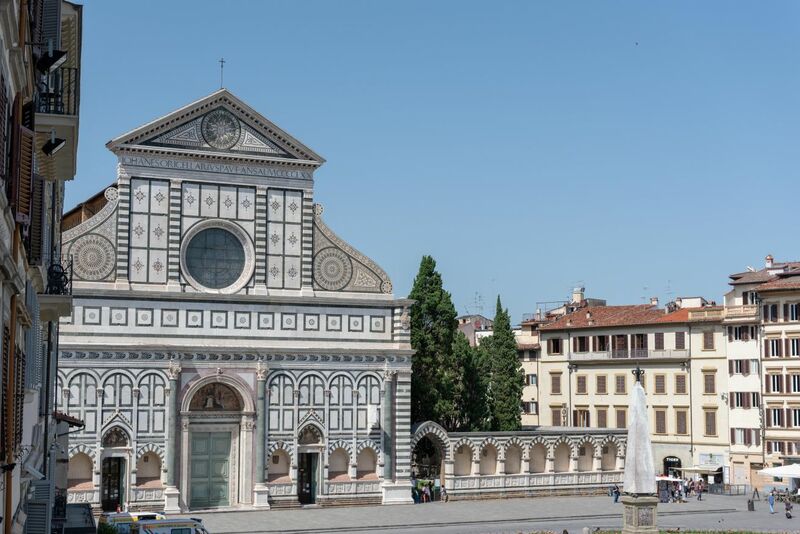 Piazza Santa Maria Novella is the ideal starting point to explore all the city on foot, being very close to every single attraction Florence has to offer, and yet being two minutes away from the train station. 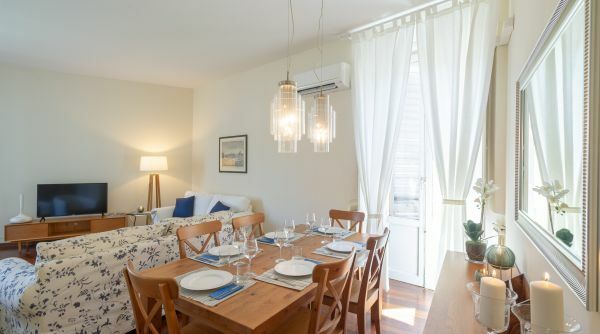 The area is a no-traffic-zone, so you won't be bothered by cars and buses running under your windows, but if you do have a rental car there are plenty of garages and parking spaces nearby. 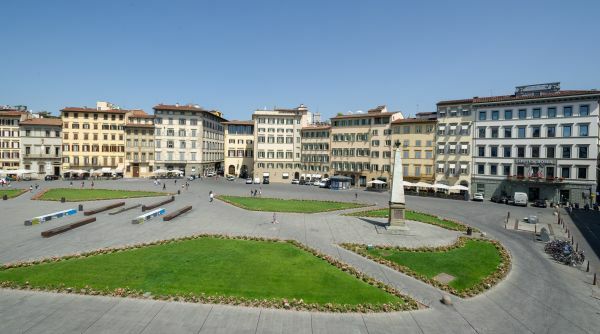 This square has a lively street artists' scene and hosts a Christmas market in December. 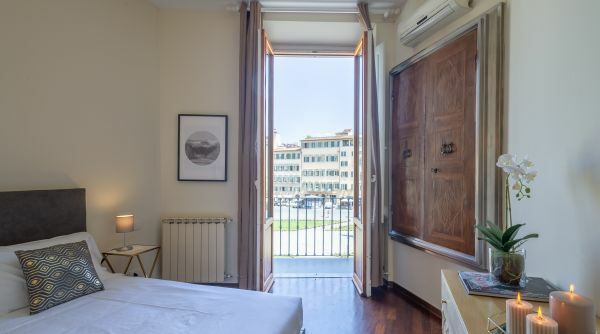 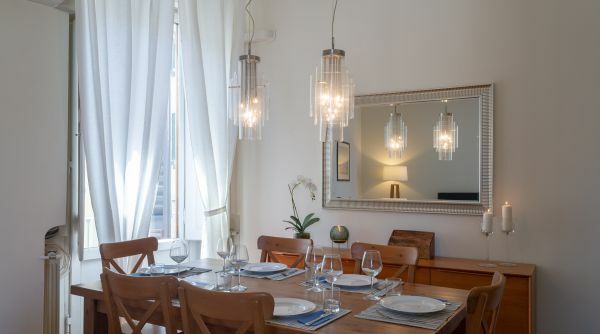 From the apartment the Duomo, Ponte Vecchio, Palazzo Vecchio, the Uffizi gallery and the Oltrarno area are all just a short walk away, in a neighborhood filled with restaurants, cafès, bookshops, workshops and really anything you may wish for during your stay in Florence.